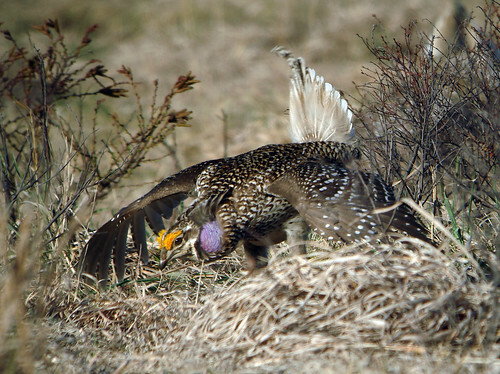 BirdWatching Magazine: great resource for seeing prairie grouse! The current issue of BirdWatching (the one in the mail right now) has a fabulous article by Noppadol Paothong, “Prairie Dancers,” that has information about where and when to watch these amazing birds displaying. Great photos, too! I’ll have to get out to the Waunita Watchable Wildlife Site to see Gunnison Sage-Grouse in Colorado, and there is also a possibility I can see it east of Monticello, Utah. That’s the one lifer I could add among the five species. I saw my lifer Greater Sage-Grouse in the Arapaho NWR (south of Walden, CO)–I’d like to get there again, just because. But I want to pick places where I’m most likely to get good photos with a 400-mm lens, and where strong conservation work is happening. 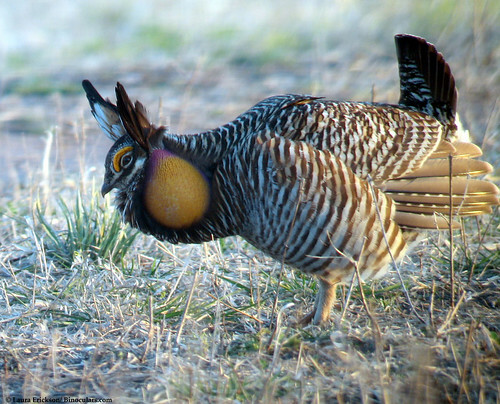 I got my lifer Lesser Prairie-Chicken in Campo, CO–I’d also like to see this splendid bird at the Selman Ranch in OK, and wherever else strong conservation work is happening. The flock of Greater Prairie-Chickens that I added to my lifelist on April 30, 1976 is now wiped out–no more prairie chickens exist in Michigan. But I want to see them in Wisconsin at the Buena Vista Grasslands, at one of the great Nature Conservancy spots in western Minnesota, and somewhere else where strong conservation work is happening to protect this amazing bird. I’ll of course have to return to the Sharp-tailed Grouse blind near Solon Springs, in Wisconsin, where I’ve gone a few times to see this cool bird. I’ll also want to get to the West to see the Columbian Sharp-tailed Grouse, the subspecies of highest conservation concern. This entry was posted in Uncategorized on February 29, 2012 by Laura Erickson.